A delicious, warming breakfast to keep you going for the morning. It is recommended that the oats are soaked beforehand as the water softens and bloats them. Put the oats in the pan and add half of the water and leave to stand for a few minutes. Add the remaining water when ready and put the pan on a medium heat. Bring to the boil and reduce the heat and simmer for 6 minutes stirring occasionally. Scatter the flaked almonds onto a baking sheet and place under a medium grill for 1-2 minutes until golden and set aside. Meanwhile, check the porridge. 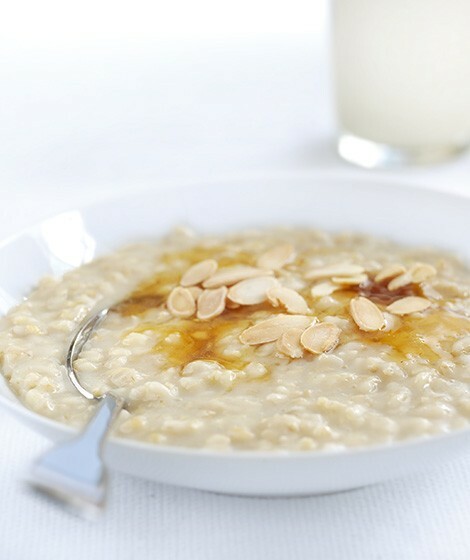 Once the porridge has reached its desired consistency, serve into bowls, top with a generous tablespoon of honey, sprinkle with some almonds and serve immediately.